The Toyota Camry is the best-selling car in America, the crown jewel of cars in the auto industry. Toyota tells us the name 'Camry' comes from kan-muri, which in Japanese means 'crown.' That seems appropriate given that the Camry outsells such popular gems as the Honda Accord and Ford Taurus. The Camry appears to be a perfect transportation appliance, flawlessly performing its duties, never annoying its owner. It rides smoothly, softly over beat-up city streets. The interior is ergonomically excellent, with big climate and audio knobs that are easy to adjust. The seats are comfortable. The Toyota Camry was all-new last year. A longer wheelbase brought significantly increased rear-seat legroom. Its new look is at once taller and more rounded, in keeping with current fashion. For 2003, the Camry offers more standard and optional equipment. All models now come with remote keyless entry, while the XLE model adds fog lights, and a six-disc CD changer for its JBL audio system. Also new is the availability of power adjustable pedals. Given Toyota's reputation for quality, durability and reliability, the 2003 Camry should once again prove to be the ideal car for about 400,000 buyers who don't want to worry about their car. The Toyota Camry comes in three trim levels: LE, SE, XLE. Each comes with a choice of engines, a four-cylinder or a V6. Most models come standard with an automatic. The basic four-cylinder LE has long been the most popular Camry. It retails for $18,970 with a five-speed manual transmission and $19,800 with a four-speed automatic. Either way, it comes with air conditioning, power windows, power mirrors, power locks and remote keyless entry, a 60/40 split rear seat, and visor vanity mirrors. SE is a sportier version of the LE. Higher-rate springs, shocks, and anti-roll bars contribute to crisper handling, along with higher-effort steering and bigger wheels and tires. Outside, black trim at the front end, a spoiler at the rear, and unique black pearl badging distinguish the SE. A three-spoke leather-wrapped steering wheel and lots of bright trim add zing to the interior. SE lists for $20,310 with the manual gearbox, $21,140 with the automatic. The cushiest Camry is the XLE, featuring luxury appointments such as wood-grain trim, power driver and passenger seats, automatic air conditioning, an alarm system, a cargo net, and a rear-window sunshade. Prices start at $22,295 and the automatic transmission is standard. The Camry's four-cylinder engine is a 2.4-liter, 16-valve twin-overhead-cam unit rated 157 horsepower at 5600 rpm, and 162 pounds-feet of torque at 4000 rpm. But buyers can also choose a 3.0-liter, 24-valve V6. All-new last year, the V6 develops 192 horsepower at 5300 rpm, and 209 pounds-feet at 4400. Both engines are all aluminum for light weight. The LE V6 lists for $22,260; the SE V6 for $23,700; and the XLE V6 for $25,405. V6 models are offered only with the four-speed automatic transmission. Camry's list of option packages is amazingly long, enabling savvy buyers to order exactly the right Camry to suit their taste and budget. We highly recommend opting for anti-lock brakes (ABS), brake assist, and vehicle skid control, all of which can help you avoid a wreck. We also recommend the optional side-impact and curtain airbags to protect you in a crash. V6 Camrys and all XLE models come standard with four-wheel-disc brakes with anti-lock (ABS) and electronic brake distribution (EBD), but skid control and the side-impact airbags are optional. Toyota still builds the Camry Solara coupe and convertible based on the previous-generation (pre-2002) Camry sedan. 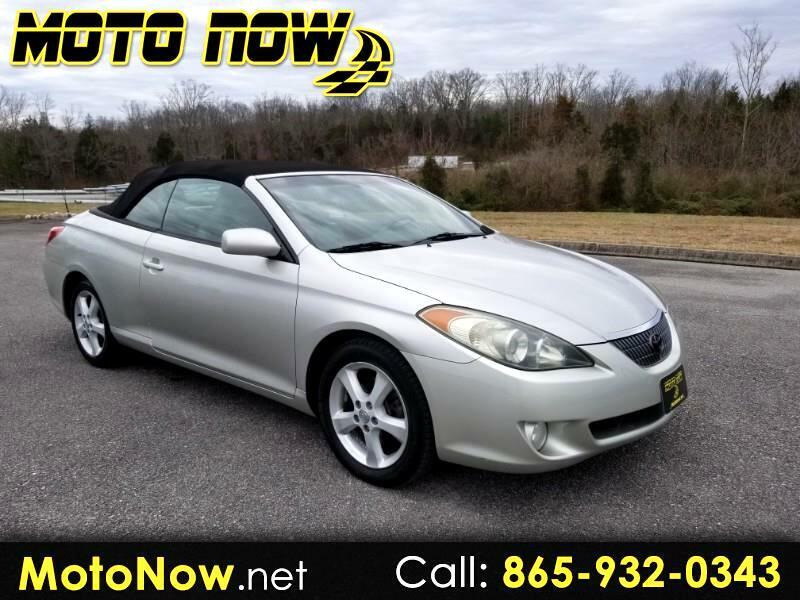 Look for an all-new Solara to debut as 2004 model.